John and Rebekah in the forest. Rebekah almost 6 months old. The hunting net strung behind them. After more than two years in Epulu, we still started each morning with a face wash at the river. For a few minutes the morning was just the river: the cool feel of it against our faces, its white riling around boulders mid-stream. In March the water was low and its rapids were brilliant with morning sun. Downstream, the mist rose between islands, streaked by shafts of light. We did not linger. Those last months there was so much to finish and always a particular caution for Kasambaka. We didn’t leave her alone for more than a few minutes. I followed John as he sprinted up the hill. In the bedroom she was still sleeping, as round-cheeked and healthy as ten minutes earlier. Although the mornings were no different than they had always been, I felt as though we were living an allegory written by someone else. I puzzled for meaning in the simplest acts. John and I at our desks: a few calculations to finish from the night before, and then to move on and prepare for the fieldwork of the day. Sarah was outside in the kitchen. She and Kole claimed their leftovers and were scrubbing a pot to heat them as the din of the parcelle started to rise around them. Only earliest morning was quiet. Basisionoko was first to arrive already lighting the kitchen fire when we went to wash our faces. He walked through the forest corridor with monkeys still at their dew-wet night perches. The black and white colobus’s first broadcast was boomed through the semi-darkness with Basisionoko the only person moving beneath. Not long afterwards, with the last bit of night still dissolving, Banabepteme, a Budu villager who had the daily job of checking our rodent trap lines, sauntered down the path past the still sleeping Mbuti camp where he yelled friendly taunts towards the empty barraza. Sarah, more than us, was right in the center of the parcelle’s morning activity. Palais attracted people, each morning, like salt fish attracted bees when laid to dry in the sun. On our parcelle people surrounded the fires, jockeyed for the warmest place, for a bit of tobacco, and laughed in unison at a particularly clever jibe. Those last months the clamor started ever earlier. Sarah told us, as Kole had told her, that in reaction to Banabepteme’s early morning taunts my forest team, Tshukiza, Atoka and Kenge, were waiting at the zamus’ barazza in semi-darkness the next morning. Sarah had run to join them just before Banabepteme arrived. Kenge immediately offered him a steaming morning tonic of cola nut (Cola acuminata) and honey “to help banish the lazy Budu blues”. Banabepteme’s look of consternation won uproarious self-congratulatory laughter. He accepted the plastic mug and pushed his way between Atoka and Kenge joining them at the fire. Lese-speaking Mbuti from across the river, Ramo and Luis, followed soon afterwards with forest fruits for the duikers we kept in pens under the mbau trees. Despite their meek smiles, the Lese Mbuti were showered with good-natured abuse. Lese were, after all, a tribe that would have continued their warfare with the Bila tribe if the Belgians had not imposed iron peace and order several generations earlier. Kenge never failed to comment about the women of the Lese Mbuti. Although the men themselves had collected the fruits, Kenge asked which of the pretty girls had done the work today, even insinuated something about her need for a strong and potent Mbuti paramour from among her obliging Bila-speaking neighbors. Along with the fruits, the duikers ate sweet potato leaves. Every morning Banabeteme’s little brother, Kasea, and his sister, Regina, collected sweet potato leaves from abandoned gardens. They came running down with huge viney bundles on their heads scattering dew as they tossed them to the ground. Then they joined Sarah to dry out by the kitchen fire where Kole and she were sharing the leftovers. By this time the daily work crews were complete. Just the noise itself was enough to let us know that it was time to leave for the forest. With spare traps and bait, notebook and specimen bags, Banabeteme was already off to the trap grids. John was overseeing the weighing and cutting of forest fruits for his duikers. I left with my noisy contingent to continue forest surveys on the east side of the river. Now, because of Kasambaka, another person was added to my forest crew, sometimes Aasha, sometimes Safenia, to carry umbrella, extra cloth diapers and a light blanket. I needed someone to hold Rebekah while I was measuring, writing, or collecting. The needs of a baby, however, were easily integrated into the work of each day. In the village, Azama, too, had a caretaker for her new infant. Every morning her young cousin came along to hold the baby girl in the shade of the towering tembu trees left standing at the edge of the garden. As Azama harvested and cleared, her baby slept or lisped non-musically in accompaniment to some simple song. Dry season was a relief. At least for now, early rains would not break the day. The palais clearing became quiet. Kasea, now out of school, lingered a bit with Sarah and Kole, but as the sun shone plainly onto the salt fish and warmed the pile of kitchen wood, he ran up the path to join his mother and sister on their hike to the garden. During dry season the morning haze burned off quickly. I was glad to be in the forest as the sun began its relentless rise towards noon. Kasambaka was asleep with her head on the crook of my arm, her body warm through the mazembe against my side. We had passed the villagers cutting new gardens, hot, strenuous work. Azama’s brother was helping her put in their plot for rice. Kasea’s parents were cutting forest along a line with other Budu who set their gardens in a single row to make it easier to chase away crested mangabeys (Cercocebus galeritus) or elephants that would otherwise destroy bananas and peanuts. Sometimes Kasea followed along with us calling a good-bye when he veered off through the piles of slash and felled trees that marked the beginning of the Budu gardens. During those last months what I saw, and even what I did not actually see, was carved into my mind as onto a marble freize with all the poignant detail of loss or of life. In town, the dry-season noon was shadowless and the sun remained persistent into the afternoon. It was just such an afternoon that Kasea ran ahead of his sister and mother back to the village and the river. 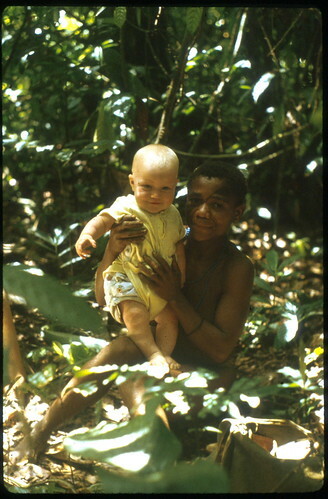 A half hour earlier, he had stood briefly on the cool forested edge of the family garden where he ate a last morsel of leaf-wrapped manioc and beans. After a quick cooling, Kasea and his friends planned to play soccer. He was thigh deep in the Epulu River with Joseph and Paluku. Like Kasea, they also had just finished the 6th and final grade in Epulu. Across the river the forest shimmered green in the heat. Beneath the forest a naked rocky ledge was exposed where the dry season river had retreated. Boulders that had been buried beneath current now pulsed dry and hot. The forest’s cool interior was distant. Joseph started beating the water. He was bent over; both his arms worked up a high spray of water. A two-tone drum beat, it could certainly be heard clear across the village. Kasea was soaping up thoughtfully. He had had the highest exam score and the highest overall marks in the 6th grade. Courses had just ended. It was almost certain he would continue to secondary school. Then what? He was twelve, almost thirteen. Paluku started dancing. Rivulets of water ran down his torso as he combined a rhythmic shoulder beat with a graceful, much exaggerated hip swivel. Joseph whooped. Kasea, jerked from his reverie, whooped and joined Joseph with a counter beat. Spray and little waves rose all around them. Kasea’s soap slipped off the rock into the current. “Your soap”, Paluku called as he executed a backwards step and half turn from the hips. Kasea whirled around. It was an almost new soap. It should last another week; his mother and sister would bathe as soon as they were back from the garden. He felt with his hands down the side of the sloping rock. He just touched it, but it slipped down a bit further. He couldn’t swim. Almost none of the village farmers could swim. But it was just there, a little farther. The beat continued. Impervious. Then it stopped. It was two hours later that we heard the news. I was just back from the forest and John was sorting preserved specimens on the floor. A group of villagers came to ask for binoculars. They needed to see if Kasea had been swept downstream. The faces at the door were dazed, already resigned. We understood. John pulled his binoculars from the shelf, showed the men how to use them, but explained that they did not have the power to see through water or through rocks, just to bring them closer. Disconsolately the men scanned the boulders further downstream. Perhaps Kasea’s body had gotten caught in the stripped branches of a marooned and water polished tree? Or perhaps between the split rocks that divide the current before the bend in the river? Or… These were men unable to do anything to allay a sudden loss. We stood with them on the ridge above the river. Rebekah leaned over my elbow to watch Sarah who was talking to her in a sing-song voice. The adults talked in low voices. Safenia gathered Kasambaka from my arms, stood with us a few minutes and then followed Sarah up to camp. There were very few people who could swim. John went to help a fisherman from the Mugenya tribe whose homeland was the Congo River. The two of them dove for the body in the pool just beyond the ledge where the boys had been bathing. John was amazed at the depth. His chest and ears were pounding and still he could not reach the bottom. The river looks shallow as it slips around the sun bleached rocks, perch of the social pratincoles and the lone razor-poised heron, but it isn’t. The divers eventually gave up. On the shore, Banabepteme and Kasea’s father had been sitting on rocks, hunched over. They rose slowly and surrounded by a group of neighbors, made their way back to their house. Pierre was someone that I had met just once, two years before when we first came through Kisangani. I saw him now, as I saw everything, with an acuity, sharpened by the community’s grief and by our own brush with eternity a couple months earlier. I noted each passing detail as though it might contribute to a critical life-saving understanding. Pierre bustled around the Landrover with self conscious energy setting up his traveling specimen-preparation equipment with the flourish a troubadour might have unwrapping his musical instruments. 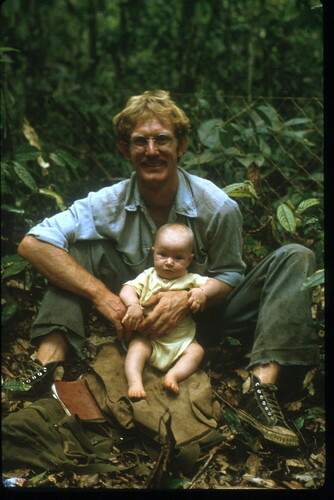 Just after Rebekah’s birth John had mentioned to me that Pierre would stop in on a collecting trip through the Ituri. John had seen him on his trip to change money in Kisangani. What I remembered from Pierre’s bachelor apartment were huge shoulder-high baskets artfully arranged, each filled with the skulls of a particular species of monkey. As Sarah and I wandered from basket to basket he had engaged John in a loud tirade regarding the current administration of the Kisangani University. Pierre was a Belgian-paid assistant in the laboratories, but his dearly held ambition was to use his extensive collections of skulls and bones to get a Ph.D. in Belgium. He paid villagers to collect for him throughout the province. The mood at palais was heavy. I wanted Pierre in his display of prowess with skinning knife to somehow respect the community tragedy. When a life is lost there follows a period of clarity when your own mortality and that of loved ones becomes poignantly clear. The community was living that raw moment. “A young boy who worked for us has just drowned”, I said. Pierre paused. “Alors. Then you have nothing to worry about”, Pierre smiled as though he had just solved a problem and continued to tease the Colobus skin away from the protruding backbone. Sia, the Zairian student, who was pulling gear from the Landrover, looked at Sarah and me, but said nothing. John showed him a flat area for the tents. Later Sia said, “Death is like that. It just happens; it takes at random without mercy; it could have been any of us.” I felt better. Obviously Sia had experienced death. Sarah and I went to Kasea’s house while John was helping Sia put up the tents and Pierre was curing the skin from his monkey. We left Rebekah asleep, after nursing, in Safenia’s arms. 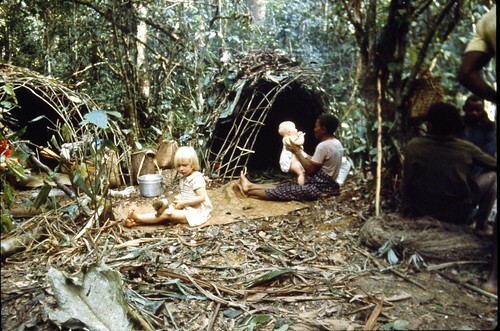 Kasea’s family lived in a small mud-walled house, one in a row of Budu houses, each surrounded by hibiscus plants and a small orchard of guava trees, papayas, bananas and oil palms. Kasea’s house was full of people; families of the Budu ethnic group living in Epulu came and went, as well as many others. Women were carrying wood to piles on the small packed dirt courtyard. As had happened with Kalume’s death, fires would burn all night. A group of men were talking while others were arriving with raffia chairs or palm-liana stools. Sarah and I greeted a few people and went straight to the house. Inside the sound of keening was deafening. Sarah huddled close to me as our eyes adjusted to the dark. The family was sitting on the floor, each dazed, entirely alone in their grief though surrounded by neighbors and friends. It was the others who wailed; they sat behind and between Kasea’s father, mother, brother and sisters. The family was stunned, each bent and staring off into some individual eternity. It was a bodiless wake. We deposited the paper-wrapped coffee and sugar, sat briefly and then returned to Palais. Sarah was quiet. She did not have a very clear idea of death, but the grief of the family made a strong impression. Banabepteme, the master of riddles who would always joke with her and her friends, had sat dumbly, seemingly unable to recognize the people around him. Next morning we left Sarah playing with Rebekah under the mosquito net. There was a kicking of legs and arms and excited conversational cooing in response to Sarah’s story. Soon Rebekah would be six months old. At the outdoor barazza, Sia, John and I examined our rodent collections. Some rodents had been caught at piles of mbau seeds, some had been caught at John’s seed-dispersal observation trees and some had been caught on the trap grids monitored by Banabepteme, Kasea’s older brother. Sia, too, had run extensive traplines. His had been on different islands in the Congo River near Kisangani as well as on the mainland. We compared identifications. He pointed out which rodents in our collection were different from those he collected 450 km west. It was not until the sun was well up that Pierre popped out of his tent. Whereas the Polish professor undid the zipper slowly and sat for a few minutes with his hairy legs spread-eagled on the packed dirt in front, Pierre leaped forth and did some rapid running in place, pumped his arms and bent at the waist. Kachalewa, who was filling the water barrel by our house, stopped to watch in amazement, his bucket still balanced on his head. Pierre jogged past him to the river for a refreshing wash. The professor limped slightly as he walked to wash his face in a small basin Kachalewa filled from the barrel. As instructed, Basisionoko had coffee ready for both of them. Pierre brought his coffee up to the barazza, examined the rodent specimens briefly and followed our animated discussion with Sia. Primates were the mammals Pierre knew and cared most about, but he looked over the keys for rodent identification, nodded his head and raised his eyebrows in shared concern as the discussion moved on from what was known about the forest’s rodent fauna, to the enormity of what was unknown. Sia insisted that rodents alone were ample reason for conserving habitat. At the University in Kisangani, he assured us, there were Zairian students and young professors who could be rallied around the conservation cause. Pierre emitted a loud dismissive grunt, though he continued to nod absently while sipping his coffee. Sia held firm, he was certain that his Zairian colleagues could make a difference. While we were repacking the specimens, a shout came from upstream. John rushed down our hill and disappeared in the river-side forest. A few minutes later he sent someone to get a clean sheet. Kasea’s body had bloated and risen. Sarah came outside. Was Kasea OK she wondered. “No, honey, he’s dead,” I told her and took the sheet down myself. “Are you leaving,too?” Pierre asked. He was obviously annoyed. We had just started discussing some theories of Pleistocene forest distribution and how his baskets of skeletons could help test them. “I’ll be right back”, I called as I leaped down the hill. I did not know Sia very well, but was confident that he would say something to excuse what Pierre must have seen as impoliteness. The burial would be that day. Atoka, Tshukiza and several others went to help dig the grave. When Pierre and his companions left the next morning, Sia again mentioned the drowning. As he shook our hands, he said he hoped that the accusations of sorcery would not be too disruptive to the family. Then he slipped into the back seat. Pierre finished a story started over morning coffee. It ended with a ribald joke. The professor guffawed loudly. We all smiled and waved goodbye. They hoped to get back to Kisangani in one day now that the roads were dry. Sia was right about sorcery. Two days later we heard that Kasea’s father had attempted to hang himself after being accused of sorcery, of selling his son to the chunuzi (water witches) of the river in exchange for fishing success. But blame was soon shifted to remote relatives, in the distant town of Wamba. The grieving family paid a fine and the matter was dropped. More than a century earlier, before Stanley and before the Belgians, there had probably been fewer accusations of sorcery. During those times, called times of war, Wakati wa Vita, many deaths resulted from direct clashes with a clan’s sworn enemies. Such deaths were easily understood. Death by poisoned arrow would not raise suspicions of sorcery. The agent was known. If a child or young adult were taken into slavery, there would be no accusation of sorcery. The family, if any survived, would grieve. Their child was beyond the reach of their love, could possibly be killed, even eaten, but there would be no accusation of sorcery. If, however, even during the early 19th century a strong and able person sickened and died of disease or was lost in an accident, how was it understood? Why, between wars, or when you had won repeatedly, again and again, why should a loved one die? Sorcery was the most reasonable explanation. There was no germ-theory or medical diagnosis; there was no other explanation. Why, when life is good, love fulsome and plans ambitious, why would someone die? We had other explanations, but somehow they too were inadequate. The question remained between John and I, though more silent than discussed. Our discussions were our work. Those first five months of 1983 were our last five months of field research. Although we had more than enough in our notebooks to complete dissertations, we easily admitted we had barely touched the mysteries of forest duff, forest canopy and all the living energy in between. John had a radio-telemetry project underway just downstream from Palais. He had radio collars on several blue duikers (Cephalophus monticola) and on a couple bay duikers (C. dorsalis). After a night “follow”, he would walk up through the bananas and cassava behind the kitchen, tousled and exuberant in the first light of morning. His pants were wet to the knees and the hand-held antenna was hooked over his shoulder. He was full of stories of that night in the forest: the sounds, the duikers. One night a dwarf forest crocodile had come up the Nembongo stream. It had been just below the log John used to cross and he did not see it until balanced mid way, he looked down and its eyes stared back unblinking in the beam of his headlamp. We shared a breakfast of leftover rice and beans and then, as John was looking over his notes or seeing to the captive duiker, I would take off with my small crew to measure the shoots grown from transplanted seeds or to work on the forest composition plots. Rebekah came with me during the day, sleeping against my body, watching the canopy overhead, nursing as I rested on a tree root, then sleeping some more. In the late afternoon, however, she was the center of attention at Palais. On an ndolo mat, outside with the women by the kitchen, she could almost sit up, although she eventually drooped forward, at which point she would pretend that she really had wanted to examine her toes anyway. Sometimes inside, Sarah and Kole would lie in front of her, offering her a spoon or a rattling seed pod. By late February she was just beginning to get the motor control to reach for things that caught her fancy. Slightly cross-eyed with concentration, she would work the rapidly pumping arms, with enormous effort, in the correct direction. But as night settled, John looked at me; we raised our heads together to sort through the sounds of the night; I looked at him. Sarah was in her bed asleep. Rebekah was sleeping in the middle of the wider bed that John and I shared. I raised the mosquito net and leaned close. How did her breathing sound? I raised the little cotton shirt and watched her chest rise and fall. Sometimes John stoked the kitchen fire before coming to bed just to make sure that there would be coals if a fire were needed later. Readiness. If she had any sign of a cold the uncertainty was almost tangible. Several times John got up to boil water and bring steaming bowls into the bedroom. Twice John held up a sheet like a tent while I cradled Rebekah over the steam until her breathing became easy. In the morning Rebekah’s spirits were high and our uncertainty evaporated. A casual smile in her direction won “coos”, laughs, and excited flapping of the arms. As John and I bustled around in the morning, organizing for the day’s work, Aasha or Safenia hustled their Kasambaka off to the kitchen. As her coordination increased she worked harder and harder to join the activity around her. By late March, if someone held her hands she could stand up. She wobbled on her plump legs, got her balance, got up on her toes and did knee bends. As she pumped her legs in an ecstasy of accomplishment someone, perhaps Safenia, started singing, another clapped hands and the unsteady jerking of the diapered hips masqueraded as a controlled marking of the beat. According to plans made a year earlier John and I both would go into a forest camp for a week or more. This data would complete John’s dry season information and it was the type of questioning we loved the most and only had in the forest together. It would be the first forest trip since Rebekah’s birth, the first since she had been sick. Should I go with John, or stay? A year ago there would have been no question. Recently our understanding had changed. In the new context of uncertainty we realized even our Mbuti guides, the keepers of forest wisdom, had only partial knowledge. Small observations that previously would have gone unnoticed now seemed portents of greater uncertainty: One morning, standing by our vehicle, Chaminyonge, the barefoot mechanic from the southwestern Mbo tribe, and Banabepteme, whose Budu tribe was from the northwest, were eating with great gusto the fruits of a Landolphia liana. Kenge watched with disgust, Tshukiza with curiosity. Apparently it was a rare species of liana in this part of the forest but became more abundant further west. “We don’t eat that”, Kenge said emphatically. I tasted the pulp, it was as sweet and firm as the edible Landolphia. Could it be that the Mbuti were not really “native” to this part of the forest. Had they come here in, perhaps, the last century or so from farther east – the edge of the forest – where the liana did not occur at all? Most questions were unanswered. Soon we would leave with so much unlearned. If we did not go into the forest now, would we ever learn about the dry season hunts? Twenty years from now would there still be duikers and Mbuti hunters to inspire someone else to ask similar questions? The real question was, should I – and Kasambaka – go with John? Evening discussions brought us back to Tom and Lisa’s insistence on conservation. When they predicted massive changes we were unconvinced, but now impermanence seemed frightfully normal. Could a protected area continue to permit a forest way of life, net hunts and foraging, and still forbid forest loss to cultivation and logging? It would be good to discuss all this in the forest – with time and inspiration. We figured that in camp we would sleep in an endu, essentially on the ground. We could carry an extra blanket, fold it and put it under Rebekah. We would be that much farther from medical help. But it was the dry season. Rebekah’s breathing was clear. She inhaled the forest air as though she would become drunk on it. We went. Safenia, Kasambaka and Sarah at forest camp. All our uncertainty was rooted in one past event, an event that started in December a few short weeks after Rebekah’s “coming out” party. Usually, at the end of the year, by the middle of December the dry season has started and roads are once again passable. We had assumed that 1982 would be a normal year when we decided to go to Nyankunde at Christmas. We would show Rebekah to Kahiigwa and Hannah and, at the hospital, she could also be given those birth vaccinations that she had not yet gotten. The road trip to Nyankunde, when the roads are reasonable, can be done in one day. It’s about 200 km away, with the first three-fourths of the trip through forest. But it was not a normal December and the rains had not even slackened. Still, shortly after Rebekah’s birth, we had decided to go, and we still had not changed our mind. As with any other road trip our car was full of people. Along with our family, Chaminyonge came to help with breakdowns and Aasha to help with washing diapers; then Majina, or Térèsie, the daughter of old Kalume, her daughter and two other passengers were taking the opportunity of a ride to a closer mission station, Mandima. Even when we set out at dawn on the 23rd of December, although hoping for an uneventful trip, the reports from the vehicles that reached Epulu were not good. We were, therefore, not surprised to join a line of vehicles at massive mud holes about 20 km down the road and then again 5 km further on. I climbed from the cabin and rearranged myself to nurse Rebekah on a fallen log spanning the narrow verge between forest and road. Térèsi clambered from the back and Chaminyonge handed down her daughter. She sighed, settled beside me, then, with the silence of the forest behind us she became attentive. Without saying anything she watched Rebekah as Rebekah nursed stopping to cough several times. Majina ran her hand lightly over Rebekah’s belly. “Are you taking her to the doctor?” she asked. I was alarmed, but then Térèsi had not been watching Rebekah closely the way we had. Rebekah, not yet two months old, had seemed to get a little cough a week ago. There were so many deep coughs going around. But now it had the humid sound that a cough gets as it is clearing out. Certainly she would be fine. A truck with a group of soldiers joined the line up behind us. Front tires in a puddle and back tires half buried in mud, the chauffeur cut the motor. It looked like a long wait ahead. The soldiers swung down from the carrosserie and ambled up, guns over their shoulders, to the main crater where two trucks seemed sunk as though in quick sand. After brief counsel, four of the soldiers strode back to the truck from which they were hitching a ride. Guns prominently on display they rode back five km to get the caterpillar from the idle road crew. No pay, no fuel, the road crew had no intention to work, but the guns would persuade. The remaining soldiers sauntered up and down along the line of parked vehicles. They roused aide-chauffeurs (the drivers’ assistants) from mats where they snoozed under trucks, they got verbal guarantees of contributions of diesel for the caterpillar when it arrived and they helped themselves to what some ladies were cooking over a small fire. Boys and young men, their ragged pants and shirts already caked with dried mud pulled out their shovels and axes. There were a few crude jokes and shouted challenges between vehicle crews but within a half hour what had been a quiet and almost sullen accumulation of separate groups of people became a single united front ready to dig, push and move on beyond this series of holes. We had been about to give up and turn back but now were hopeful. Térèsi and I called Sarah and her daughter to our log. They were sticking twigs in the mud in the center of the road but now activity was mounting around them. They should be out of the way. I wrapped the cloth around Rebekah, encircled her warmth, and listened to her breathing become more even as I heard the Great Blue Turacos call over the tumult in the ditches. Chaminyonge was digging with the others and John was helping to attach cables to a truck further up the line. The caterpillar took almost an hour to move any one truck through the morass. I had not brought any lunch for Sarah but Térèsi shared her “viazi and sombe”. Eventually we were through, and finally we arrived at the mission of Mambasa. It had taken us 12 hours to drive 70 km. The Protestant mission post at Mandima was just outside Mambasa and had been started by Dr. Woodhams to whom Putnam had walked for dental treatment in 1932. It was during that trek towards Mambasa that he decided to build his hotel on the banks of the Epulu River. It was also in Mambasa that Putnam died in 1953, at the age of 49. There had been a series of Protestant missionaries at Mandima in the 1970s and the 1980s. It was the American, Eddie Baxter, who put in the airstrip, “softening” the rocks with extreme heat from forest-fueled wood fires. Local Christian converts then split the blackened boulders with sledge hammers. Drawn in by the expanded hospital and new school, the immigrant flow from eastern mountain and savanna areas became funneled towards Mandima. Each immigrant opened a forest garden, and the following year a new, bigger garden. The forest had been pushed farther and farther back. Little paths fanned out from the mission station through regrowth scrub in every direction toward distant gardens. A Swiss family, the Dortayes, now lived at the mission, in the center of a vast clearing. The mission seemed so welcoming after the muddy chaos of the road. A tree lined drive, lawns, and flowers. The Dortayes greeted us warmly, outfitted us with kerosene lanterns and showed us to one of the Mission houses. No one was living there right now. We should make ourselves comfortable. We did. They lit a fire under the barrels outside and within a half hour we had hot water for showers. Our passengers dispersed. Chaminyonge slept in the Landrover; Aasha refused the cot, preferring to sleep on a mat on the floor; Sarah hesitated between sleeping with her or sleeping on a cot. She finally chose neither but curled up instead next to John in a narrow bed. Rebekah and I had the narrow bed just adjacent. Exhaustion overcame us all, but Rebekah did not sleep well. She did not nurse well during the night. She woke me again and again. She would sleep only on her stomach, whereas she usually slept on her back. Sometimes she slept best on top of me and sometimes to the side. The night seemed long and quiet without reassuring forest sounds just outside the window. Instead the curtains shuddered silently in the breeze and a dog barked distantly from the boma. In the morning I told John that Rebekah had not slept well and we decided that I should take her to the nurse, Kisezo, before we traveled further. The dispensary. We sat among benches of patients at the outdoor barazza. Mothers with children. Old men holding their heads. Old men leaning on crutches with their legs wrapped in rags. Sarah and Aasha came and went. I walked up and down between the benches holding Kasambaka close and staring out towards the distant forest where mist was rising. When our turn came to see Kisezo I hoped that he would tell me not to worry, a small cold, it will go away. I hoped, but I had misgivings. There has been no fever, I told him. He listened with his stethoscope. It was bronchitis, he said, and there were “rattles” throughout her chest. He prescribed an antibiotic, pills I needed to crush and mix with water. I told Kisezo that we were on our way to Nyankunde, where the principal protestant hospital for the province was located. “Take her to the doctor as soon as you arrive”, he admonished. But in the meantime John decided to cancel our trip. Chaminyonge had been asking for news up along the road and heard about terrible holes another 40 km further east. Then, it started to rain again. We would stay here at the Mandima mission through Christmas and until Kasambaka was better. During the afternoon Rebekah started having coughing fits with calm periods in between. John, Sarah and Aasha went to Christmas Eve dinner at the Dortayes; I told them to bring me something back, that I would stay with Rebekah. It was then, while they were gone, that I got frightened. There was such a look of panic in Rebekah’s eyes. During a coughing fit, she went tense in my arms, she started screaming and kept screaming. Outside in the gathering dusk I saw a small girl skipping along with an empty gerry can; I called her over and said to run quickly to get Kisezo, it was an emergency. Ten minutes later when Kisezo arrived Rebekah had quieted. He stayed a few minutes, but then returned to the dispensary. “Call again if you need me,” he said as he left. I knew that she was concentrating on breathing. I could feel Rebekah strain as I held her. And I no longer held her comfortably against me, not now, but I held her on her stomach, across my arms flat in front of me. This was the position in which she seemed least panicked, and most able to breath. Thus, arms aching, I walked back and forth. Darkness followed quickly after a brief tropical dusk. I dared not put Rebekah down or leave her for a minute to light a lantern. I continued walking small circles in the darkness, elbows pressed to my sides Rebekah struggling for each breath. John, Sarah and Aasha returned in high spirits. They brought me a slice of duck with potatoes and gravy. There was also a piece of mango tart that Sarah carried proudly as though she had made it herself. But within seconds John registered my fear. Aasha lit the lanterns. Then Rebekah had another coughing fit accompanied by high gasping screams. Again Kisezo was called. Anne-Claude, Mrs. Dortaye, and Martine, the Swiss girl who was helping with the Dortayes’ children, also came. No further words or explanations were needed. Kisezo gave Rebekah a shot, a sedative, still she did not calm down. For two hours a gasping scream came with each breath and when finally she quieted, she was barely breathing. I now sat on a woven rattan chair, supporting my elbows on the arms of the chair with Rebekah lying, face-down, across my outstretched forearms. At first John sat close by my side, tensely quiet. Then he went to Sarah who was curled against the wall, crying. “Poor Rebekah” she choked. John carried her into bed. Aasha followed, shaking her head, and knowing that she would sleep with Sarah. John returned and sat with his arm around the back of my chair. Also silently sitting with us were Kisezo, his assistant, Anne-Claude, and Martine. Christmas eve. It was a very long night; there was no clock in the sitting room of that guest house at Mandima but when I think back it is as though I hear a ticking, as though each second like each breath was recorded for eternity. We spoke rarely but Rebekah’s labored breathing was like a desperate monlogue, one that might be broken off at any moment. There were no forest sounds outside, no hyrax, no song from a nearby Mbuti camp. Inside each of us strained towards the next breath. Rebekah, Bekah, Kasambaka. My mind repeated her names endlessly. How must it feel to drown with air all around? How could an infant, not even two months old, fight so hard? I thought of Amanjau and his baby daughter gasping for breath in the endu. It was like this, and then they buried her. Such a small grave back behind the camp. Anne-Claude brought in a basin of steaming water and placed some drops of thyme oil on the surface. She slipped it under Rebekah’s head. Did it ease the breathing. Yes, perhaps. Anne-Claude arranged a sheet as a tent to trap the steam around Rebekah. Chaminyonge slipped in and sat by the wall, watching. Martine brought in a Coleman to replace the little kerosene lantern. She kept water boiling in the kitchen and regularly brought it in to replace the water under Rebekah’s head. I held her, stomach down, over the steam. Kisezo broke the silence with a short simple prayer. It was 3 AM. He prayed for a miracle and then he and his assistant left. Anne-Claude said quietly, “The Lord knows how little we have to work with. We can only rely on him”. She left at 4 AM having tried everything she knew. She had consulted her nursing books and she had prayed. Martine never slept. She slipped her arms under Rebekah and I closed my eyes. John closed his eyes as well. For perhaps ten minutes perhaps a half hour I rested my head on his shoulder and his head was against mine. Chaminyonge slept in short fits, then left to pace under the stars and return. As the sun rose on Christmas day, Rebekah was still alive, still breathing. Certainly on this day of all days a missionary at Nyankunde would not be expected to turn on his HMF radio. Nyankunde was the central protestant mission whose hospital serviced all the satellite missions throughout northeastern Zaire. On a regular schedule the mission plane flew to each outlying clinic to deliver supplies and collect difficult cases in need of an operation or hospitalized treatment at Nyankunde. Usually on religious holidays there was no flying and no radio. But Jean-Luc Dortaye said he would try, and the pilot in Nyankunde came on line. As the little single engine plane took off from Mandima, Kisezo, Martine and the Dortayes were all on the runway. By 10 Am we were in Nyankunde and Rebekah was under a small hard plastic oxygen tent. It had just been donated by UNICEF and Rebekah was the first to use it. We had barely been there a half hour when Hannah and Kahiigwa arrived on the ward. Hannah rushed up and put her arms around me. They had been expecting us, but not to arrive as we did. Hannah touched Bekah’s pudgy little leg where it protruded from the oxygen tent. Kahiigwa told us that their house was open to us whenever we could come. There were beds, and always food. Their home had meant security and regularity during those Peace Corps years. Now, their unconditional hospitality was the greatest relief possible. We were in soins intensifs, Intensive Care, a unit of the hospital that consisted of six metal frame beds, three on each side of the narrow barracks-like building. There were just two curtains that cut off these beds from the two rows of male surgical patients, men with bandaged arms, men with crutches, one man with bandaged hands suspended in front of him. He was a suspected thief and his accusers had broken all of his fingers. A discouragement, they figured. Rebekah seemed tiny at the head of her bed under the hard plastic oxygen tent. During those first hours John and I just stood at the bedside. We were immensely relieved, but uncertain. It seemed strange to not be holding Kasambaka. Was it all her battle now, had we become spectators? Aasha and Sarah, who had also come in the plane, stood beside us holding hands, but they were mainly looking in the opposite direction. There were many other people in that dark, antiseptic-smelling hall that were not patients. They also were standing around, lounging on the foot of a bed or sitting on mats they had unrolled on the floor. The hospital had no kitchen so a patient needed an attendant, and if, as was usually the case, it was a wife, mother, or sister there would be her own youngest children that came as well. Sarah was entranced by the children that darted in and out of the hospital buildings; they balanced bicycle wheels with sticks or pulled sardine cans on strings. The actual cooking happened over leg-less charcoal braziers in a kitchen area only about 30 feet distant from the wards. Venders sat just beyond the large smokey barazza with their basins of rice or peanuts, piles of viazi, sides of beef, and regimes of bananas. On plastic ground tarps they also had cups, basins, cooking ware and folded cotton cloth for shrouds. Sarah and Aasha were stunned by the volume and combination of sounds. This was no silent hospital zone. Loudest was the wailing of children getting shots or fearing shots. The vigorous bargaining in the market area reached our ward as a low drone mixed with the closer hum of conversations and laughter of playing children. A constant undercurrent came as moans from adjacent beds broken by coughs and occasional dull convulsive retches. The day before we arrived, the nurses had hung Christmas decorations beneath the naked tin roof of Intensive Care. There were bouquets of Lantana, and Hibiscus, Canna and Bougainvillea fastened to unrolled cotton bandages collecting the noon heat and witnessing the myriad dramas that unfolded beneath. Suddenly a cry of anguish would cut the conversations. People gathered, curious and sympathetic as the weeping women and grief stricken men followed the nurse who carried a little body away. Sunday, the day after Christmas, Rebekah stopped breathing. John and I sat on the end of her bed with a young Alur nurse. We were chatting, although always glancing at Rebekah. Suddenly her face turned an ashen blue. Death blue. I threw myself, face-down, on an adjacent empty bed. The nurse leaped forward threw up the oxygen tent and administered artificial respiration. The color returned. It had been but a moment. As Dr. Kyle, the missionary doctor explained later, Rebekah was exhausted and had just stopped fighting. As soon as she stopped fighting, she stopped breathing. I don’t remember the name of the nurse. He had saved Rebekah’s life, but we were so concentrated on the life he saved that when he disappeared back into his daily routines, we never sought him out. I now wish that I knew where he had gone after he finished at the Nyankunde nursing school and how he is faring in the difficult Congo of today. Dr. Kyle said Rebekah needed a transfusion but the hospital did not have the reagents to test her blood for the RH factor. One missionary, a universal donor, volunteered and the transfusion was made into the veins at Rebekah’s temple. Yvonne, a missionary nurse from Switzerland who had started working at Nyankunde when I was in Peace Corps, tried first one temple and when the blood vessel failed, the other. The other held. Again, hope. Dr. Kyle was cautious. “On Tuesday, if she is still with us”, he said, “then I think she will make it”. It was Sunday morning. Two days and two nights remained before Tuesday. The missionaries that ran the hospital and nursing school were accommodating and generous. Pitchers of lemonade and bowls of fruit appeared at our bedside. I spent the night on the bed with Rebekah, but in the morning when Aasha came and while Kasambaka slept, I slipped out to the house of a missionary nurse, Marie-Jeanne, just next to the hospital for a shower and a cup of hot coffee. Marie-Jeanne’s house was so quiet and peaceful after the tumult of the ward. Her flowered curtains matched her tablecloth and both had the same blue as her sofa. She poured my coffee and passed me toast. “You know,” Marie Jeanne spoke quietly and confidently, “ we (she meant the single women missionaries) are going to pray every night at our prayer gathering for Rebekah.” I pressed my coffee mug with both hands and smiled thankfully. I was so grateful for their warm and heartfelt help. I would tell John. Then I hastily finished the toast and hurried back to the ward. John slept with Sarah and Aasha at Hannah and Kahiigwa’s house. Often they came with trays of food Hannah generously sent from her kitchen. On Monday Dr. Kyle invited John and Sarah to his house for lunch and Hannah and her sister brought me lunch. We stood by the bed and talked. “You didn’t eat fiyeke while you were pregnant, did you,” Hannah’s sister whispered in a worried voice. She was older than Hannah and her face was broad under the brightly colored head scarf. Fiyeke? I tried to remember. Fiyeke is a small fresh water fish with an exceptional number of small pointed bones. “If you did, it could cause this.” She jabbed her fingers into her ample chest and tilted her chin toward Kasambaka. She looked at me with sympathetic eyes. She too was a mother and if it was because of fiyeke there was something that could be done. She knew someone, a diviner…. “I really don’t think that I ate any,” I answered hesitantly. In fact I knew that I hadn’t, but I was reluctant to admit my innocence. I almost wanted this diviner to do what he could, to join the other efforts. Rebekah was now too weak to nurse. Every three hours, all day and all night, I expressed my breast milk and fed it to her mixed with antibiotics, through a gastric tube that entered her stomach through her nose. I watched Kasambaka and I watched the hospital and the other patients all hours of the day and night. There were four deaths in the six beds of Intensive Care while we were there. On Monday at two hours past midnight the old man in the bed across from us died. This was the second death in Intensive Care since our arrival. He had been brought from far away with only one person to care for him. There was no family to carry him away and no house for mourning nearby. A nurse covered his head to wait until morning while the young man who had brought him to the hospital ducked out of the ward, out from under the 24-hour fluorescent lights, to sit on the darkened steps and weep alone. On the bed next to the old man’s was a girl who had repeated convulsive fits. She was 18 years old; it had been a sudden disease. Both her mother and father slept on the mat under her bed, but they hardly ever slept. Jeanne was her name and whenever she had a bit of a reprieve she was kind and inquisitive. She asked about Rebekah and hoped she would get better. John’s strongest memory from the Intensive Care ward is Jeanne’s warm smile. We talked mainly to her parents. Obviously she had a very special relationship with her father. John would often walk across to stand near the father who would speak in a monotone hardly seeming to know that he was talking. He looked so crestfallen, so helpless, so willing to do anything to make his daughter better. Jeanne wanted her father near her constantly and the rare times she asked for anything, she asked him: “Baba, tea”. Several times we could give him tea from a thermos that Hannah had sent. He was desperate to fulfill his daughter’s every wish. Tuesday finally came. Dr. Kyle smiled. Rebekah was holding her own. The relief was incredible. Never had another person’s opinion meant so much to us. John took Sarah and Kahiigwa’s oldest son to climb the Nyankunde hill. I think he wanted to announce his relief to the world. It was Sarah’s first trip up the “mountain”, the hill John and I climbed together when I was in Peace Corps. John and Sarah saw the fires running with the wind of the dry season, already underway out here on the savanna. They saw the birds, the hobbies and swifts, banking into the wind. He told me later that on Christmas Saturday he had broken out in hives; I never even knew it. John had looked after Sarah ever since we arrived in Nyankunde, taking her to the market, to see Kahiigwa’s cows or to visit the children at one missionary’s house or another. “I now see what fathers are good for,” he said simply. We both realized that it was not our doing that Kasambaka was better. Many people had made it possible, but it had been Kasambaka’s struggle. She, herself, had fought incredibly long and hard. She still struggled, but now we knew she could win. When John and Sarah took off, I sent Aasha to the market to buy me bananas, guavas and mangos. I too wanted to celebrate. Although I was still expressing milk and feeding Rebekah through the nose tube every three hours, Dr Kyle’s optimism made the world shine. I needed something to pass out, to give people. The world was radiant, no one could do wrong. Just as well. Aasha was gone more than an hour and when she came back she could not walk straight. She had had her celebration too. A Pygmy was a rare sight out here on the savanna and she had incited a sizeable commotion at the market. The vendors plied her with the local brew mandarakba free of charge. Aasha had liberally aquiesced. The morning we moved from the constant light and watchfulness of Intensive Care to a semi-private room, a week after Christmas, should have been magnificent. Indeed, I lingered over my coffee at Marie-Jeanne’s. I know we laughed and I know I had a constant smile on my face. But as I returned to Kasambaka and Aasha in soins intensifs, Aasha, with an expression of helpless sympathy was staring across at Jeanne’s mother who, with a high choked wail, was pulling at the strings which tressed her hair. She was barefoot, her sandals discarded under the bed. Jeanne was dead. A nurse tied a cloth from beneath Jeanne’s chin to the top of her head to hold the jaw closed. I looked around for Jeanne’s father, but could not find him. We never saw him again. During the following week that we remained in Nyankunde, no matter what I was doing I had a feeling of lightness. Although surrounded by sorrow and loss, the world had been good to us. John “hitched” a ride back to Mambasa on a truck. He would take the Toyota to check on continuing work in Epulu, then return the following week. The gastric tube was removed in semi-private and Rebekah too smiled. Her first smile. Two months old and she smiled as though the sun motes were dancing for her. For Rebekah, Sarah’s laugh was proof enough that the world she had hung onto was a kind and good place. It was, nevertheless, with some trepidation that I took her for a last checkup to Dr. Kyle’s office. Would he disapprove of our returning to Epulu? Would he consider it frivolous and risky. He was not more than ten years our senior, slight of build with light brown hair and gentle brown eyes. John had told me, after lunch at their house, that Dr. Kyle and his wife were considering if they should send their nearly high school age children to the missionary academy in Kenya or if the whole family should return to Scotland. Dr. Kyle smiled broadly when we walked in. “How is our miracle child”, he asked. “She’s smiling”, I announced proudly and then more hesitantly, “John is at the Kahiigwa’s; he has returned with the Toyota and we all plan to go back to Epulu, as soon as you think we can.” “I thought you would,” he replied, unperturbed. “The bronchial pneumonia has cleared up so you needn’t stay.” He did not expect Rebekah to have a heightened sensitivity but he went over danger signs and said to send word now and then. For Rebekah’s miracle, John and I are the witnesses. Sarah’s memories will remain those of a child being carried on her father’s shoulders while her mother stays with the baby in a dim noisy building; will she even remember that? And Rebekah, how does urgency, danger, and exhaustion trace onto an infant’s memory? For us, we must write it to hold on to it and give the details to our daughters. John during his two years in the southern Ituri collected oral history. He found that in the forest, even where oral history is the only history, it does not need much detail and is inconsistent between accounts. He found details easily modified to serve wisdom. The wisdom of elders, like that of Kalume, is their ability to guide the children, not their faithfulness to static past. John hoped oral histories would fill in facts prior to written history helping him understand current relations between Mbuti, villagers and forest. There were many stories of the “Ngwana wars”, even around Epulu I heard about them. There were still names for villagers that were enslaved by the Bangwana and for family groups that fled the ivory-hunting Arabs. There was also memory of the Belgo-Arab wars; Kalume himself talked about an area in the northwest where there had been a battle. But before the “Ngwana” wars, and before ivory-seekers came to the Ituri there had been other wars, “wakati wa vita”. John’s notes were written in many small black field books. He showed me two entries that corroborated each other, written in notebook 29 and 30, towards the end of 1974. On separate occasions John had spoken with an elder of the Bakombe, Kisenge, and an elder of the Bombi, Angali Kijana, about wakati wa vita. Both spoke of a period of aggression between farmers and Mbuti, as the farmers moved into the forest. After a period of standoff, allegiances were established family by family between villagers and Mbuti. At that time, the Mbuti lived in small family groups. The new collaboration between villagers and Mbuti became essential to holding a track of forest as one village group fought another. But the wars were mainly small scale, and the remembered histories are held together as oral genealogies with little detail. It is the wisdom of the living that gives form to the past. Back in Epulu it was easy to believe in the supremacy of life. Palais was full of babies. Moshi, the cat, had three. Her second litter. Then we found a lone kitten in the roots of the chenje tree just across from camp. It mewed pathetically and though we watched all day, we saw no maternal response. Its mother must have been a wild cat. Had she died? Had she moved the rest of the litter and left this single kitten? In the evening we decided to try transferring it to Moshi. To our surprise Moshi accepted it. She just moved from licking one of hers to licking the new brightly striped bigger one that nestled right in for the teats. It was clearly two weeks older than her own kittens. Its eyes were wide open whereas her three-day old kittens were still milling around blindly. Moshi accepted our addition to her litter but refused all suggestions for lodging her family. Crate in the kitchen: turned down. Old trunk with rags in a corner: good for one night then rejected. Each change of niche required each kitten to be cradled between Moshi’s jaws for the trek to new location. Perhaps Moshi realized that Kasambaka had usurped first place on Sarah’s “to adore” list. So the kittens were carted to the foot of Sarah’s bed where Moshi leaped with each, one by one, to a chosen nest in the blankets. We positioned Rebekah in the pillows at the head of Sarah’s bed each morning to be amused until Aasha and Safenia arrived. Now Sarah could perform for both appreciative audiences, kittens and sister, at once. But euphoria did not endure unscathed, life’s supremacy was short and its end fearfully arbitrary. The dear adopted tiger kitten barely reached the age of independence when one of its playful forays in the garden resulted in snake bite and death. It was human death though that caught us up short and kept us on guard. We had been back from Nyankunde hardly a month when Kasea was drowned. Shortly after, we had an evening visit from Muzama. The girls slept and John and I were beginning to nod over our desks when there was a loud “hodi, hodi” outside our door. Muzama had brought his youngest wife, her mother and their new baby. Muzama rarely visited us and never at night, this was clearly a case of desperation. The baby was but five days old and very ill. It was common knowledge that our baby had been extremely ill and now was better. Could we do the same for their baby? We pulled back the kikwembi gently and watched the convulsive sucking in beneath the baby’s ribcage. She hadn’t nursed all that day, they told us. The mouth seemed to be wailing before any cry came. Then the cry was thin, long. I was glad that Sarah and Rebekah were already sleeping. We got La où il n’y a pas de Docteur knowing already that there was nothing we could do. We suspected tetanus. Who delivered her, we asked. The midwife, Véronique. They left with the baby who died a few hours later. In first light we went down to see Epulu’s state appointed nurse. Yes, he shrugged, there had been six babies lost to neonatal tetanus in the past two months. All delivered by Véronique. We were aghast. Even the nurse knew the midwife was spreading tetanus and had done nothing. We called together Kavira and Jean Bosco. “All the deaths could have been avoided,” I ranted. “She is cutting the umbilical cord with an infected knife.” Bosco shrugged. Kavira nodded. She said that she would talk to Véronique. But John pointed out to me that they were both Nande, Véronique was a “sister”. Kavira could not be expected to take real action. Besides, Muzama was accusing one of his uncles-in-law of sorcery, but it would soon be dropped he said, it was only a baby. I felt impotent and almost foolish. These people were grieving, truly grieving and yet they saw a completely different source for their grief than we did. We had been unable to help them and we were obviously unable to apply blame correctly. Later John crawled over the girls, asleep on the kilako, to lie with his back against the leaf-wall of the endu. I lay in front, near the fire. John and I, tired though we had been, suddenly found ourselves awake. We discussed how we would cover the net hunt the next day. A tree hyrax called from downstream on the Ekare. Another responded from close-by. There were still people sitting around fires outside, a few men at the central fire and some families at the entrance to their endus. There were occasionally bursts of laughter and low talking. An elephant trumpeted in the distance. There was immediately a rush of loud comment from the central fire as though the elephant had made a personal remark directed at them specifically. Rebekah breathed easily and evenly. The next day I slipped Rebekah into a mazembe and we hugged Sarah goodbye as she “helped” Safenia prepare some mushrooms. John and I walked quickly behind Kenge towards the first efito, or central starting point of each cast of the nets. Rebekah was looking up at the canopy pattern of sun and shadow. I was looking just beyond my feet, careful not to trip and realizing that in the maze of elephant paths I would be totally lost if Kenge were not with us. Rebekah continued to breath comfortably, evenly. John and I were both aware of it, and certain, now, that she would be fine in the ambaka. Sofi with Kasambaka at Ekare. Sofi laughing softly came running up behind us. She stopped to give Rebekah a playful mocking smile. She bent, plucked some ambaka leaves and stuck them gently between Rebekah’s head and my arm so they made a little green halo. “There”, she said, “there is your ambaka, you are back with your kasa ambaka.” She plucked more leaves, stuck them in her mulumba belt so that they appeared to be the only thing she wore and went running on ahead, disappearing in a musical cascading laugh. This entry was written by Terese Hart, posted on 2014-08-29 at 10:10 pm, filed under Ituri Story_memoire. Bookmark the permalink. Follow any comments here with the RSS feed for this post. Post a comment or leave a trackback: Trackback URL. One of the most riveting reads I’ve had for ages. What a wonderful glimpse into a world most of us will never experience. So fantastic !!! So overwhelming !!! What an experience of life !!!! Glenda and I were at Nyankunde when you were there. Would love to get in touch again.